Yes, I know it’s not Wednesday. I had this post about 90% written when it actually was Wednesday, but completely spaced on finishing it. It is still seasonally appropriate, however, so I thought I’d share it today instead. 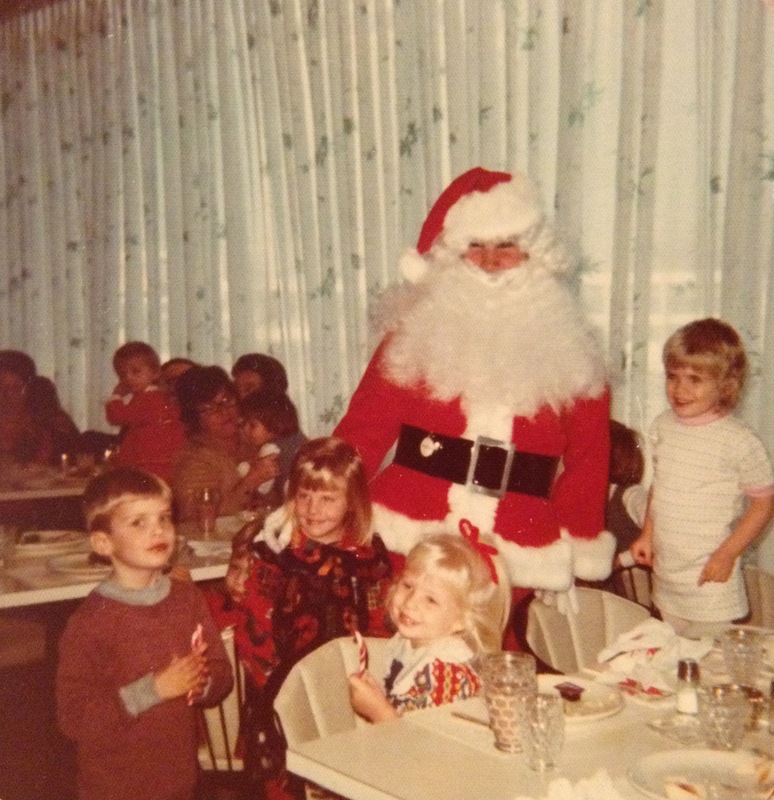 I love this picture of my cousins, brother, and me at Breakfast with Santa Claus, I think in 1974. (No little sister, and we look like a crew of three- and five-year-old kids, don’t we?) We all appear to be past the age where we’re freaked out by Santa, but we really don’t look like we want to pose with him either. Though I do have fond (if vague) memories of having gone to this event at least once, I don’t really remember when and where we used to do this. I assume it must be the weekend after Thanksgiving, because that’s when we were usually at my cousins’ house, and I know it was at a local department store, but was it Hecht’s or Woodie’s? Best thing about this picture, though? The fact that my brother is a dead ringer for his younger son. Seriously, if Kate, Sue, and I were not in this photo, I’d swear that boy was my nephew. And since it’s no longer Wednesday, and is, in fact, Christmas Eve, I’ll take this moment to wish all of you, dear readers, a very Merry Christmas (or any other holiday of you prefer). Happiness and merriment to all! It was Hutzler’s. It existed prior to the Towson Towne Center in the spot quite likely where Hechts now sits. The curtains block the upper deck of the old 2-story parking lot off of Dulaney Valley / York Road. I, too, agree that without the girls / us, the photo could pass for your nephew!!!! Mom sewed those dresses, and I remember the stash of yarn, I mean “bows” for our hair. I think I also remember the orange juice not tasting very good, and this may have been because we always drank Tang at home? Great memory! Loon is right, as it was Hutzlers. But, a correction. Eileen is there crawling into my arms, right behind Santa! At about 1 & 1/2, she was not too keen on the red-suited gent! So, it was Christmas 1975 and you others were +6 & +4, respectively. Having a great time in NYC !! Merry Christmas to all! Mom, are you saying that’s us behind Kates head. If so, I say no way, that’s not me. Holy cow!!! He could totally be your nephew!!! Amazing, isn’t it?